And the winners were StoragePug and T&T Scientific. 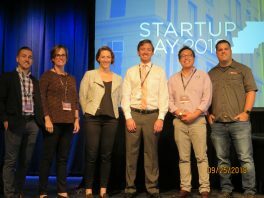 The two companies captured top honors at yesterday’s sixth annual “Startup Day Knoxville” event. For the first time in the six-year history of the pitch competition, one company, in this case Storage Pug, captured both the “Judge’s Choice” award, as determined by a three-person panel, and the “Crowd Favorite” award, as voted by the fans. 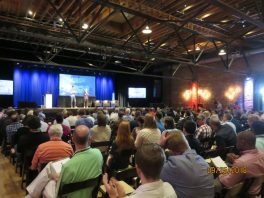 The Innov865 Alliance presented the “Judges’ Choice” award, while SunTrust Bank sponsored the “Crowd Favorite” award, and the UT Federal Credit Union presented the “Traction Award.” For capturing both competitions, Storage Pug won $10,000. The company, founded by Tommy Nguyen, is providing web services for owners of one or just a few self-storage facilities (see our previous teknovation.biz article here). In his pitch, Nguyen said the start-up has reached $11,000 in monthly recurring revenue. T & T Scientific, a company co-founded by Graham Taylor and Nima Tamaddoni, produces low-cost, single use liposome extrusion devices that simplify the process of preparing liposomes for research laboratories, manufacturing facilities, and clinical settings. It won the “Traction Award” for progress made in growing the company, something that will be summarized in a feature story in the Thursday edition of teknovation.biz. Smart RIA, a start-up led by Mac Bartine that markets a software platform that simplifies compliance for the Registered Investment Advisor (RIA) industry and winner of the 2017 pitch competition. Real Good Kitchen, a combination community kitchen and culinary incubator. “Startup Day” is the annual celebration of Knoxville entrepreneurship and the capstone event of “Innov865 Week” which is presented by the Innov865 Alliance. Founding members include the University of Tennessee (UT) Research Foundation; ORNL; PYA, the power behind teknovation.biz; UT Knoxville’s Anderson Center for Entrepreneurship and Innovation (ACEI); Three Roots Capital; Launch Tennessee; Knoxville Entrepreneur Center and TVA. Maryville College’s “Innovation in the Liberal Arts” is set for 5 to 7 p.m. today at Elkmont Exchange, 745 North Broadway. Click here for more information and to register. Techmer PM’s “SHYFT Design + Innovation” runs from 10:30 a.m. to 7 p.m. on Thursday at the Knoxville Museum of Art. Click here for more information and a link to registration. Three concurrent events are scheduled for Thursday at the UTRF’s Business Incubator. The first is a special edition of the “Rise & Grind” series that starts at 1 p.m. Immediately after it ends, there’s an open house at the facility and at the new ACEI Business Accelerator located on the first floor. Click here to register for “Rise & Grind” and here for the UTRF Business Incubator open house. Life Science Tennessee’s monthly “Beer & Biotech” is set for 5:30 to 7:30 p.m. Thursday at Elkmont Exchange. Click here to register. Finally, on Friday, UpStart Knoxville will hold an open house to show-off its greatly expanded co-working space. The event runs from 4 to 5 p.m. in Suite 140, 408 North Cedar Bluff Road. Pictured below (left) are Brandon Bruce and Cortney Piper welcoming attendees to “Startup Day.” In the picture at the right are the six presenters in the pitch event who are (left to right) Shane McMahon of Lux Semiconductors, Bailey Foster of Real Good Kitchen, Megan O’Connor of Nth Cycle, Alex Adams of GeoAir, Nguyen, and David Nelson of BrewFund.